Soaps and body bars have been around forever, but that doesn’t mean that they shouldn’t change with the times. 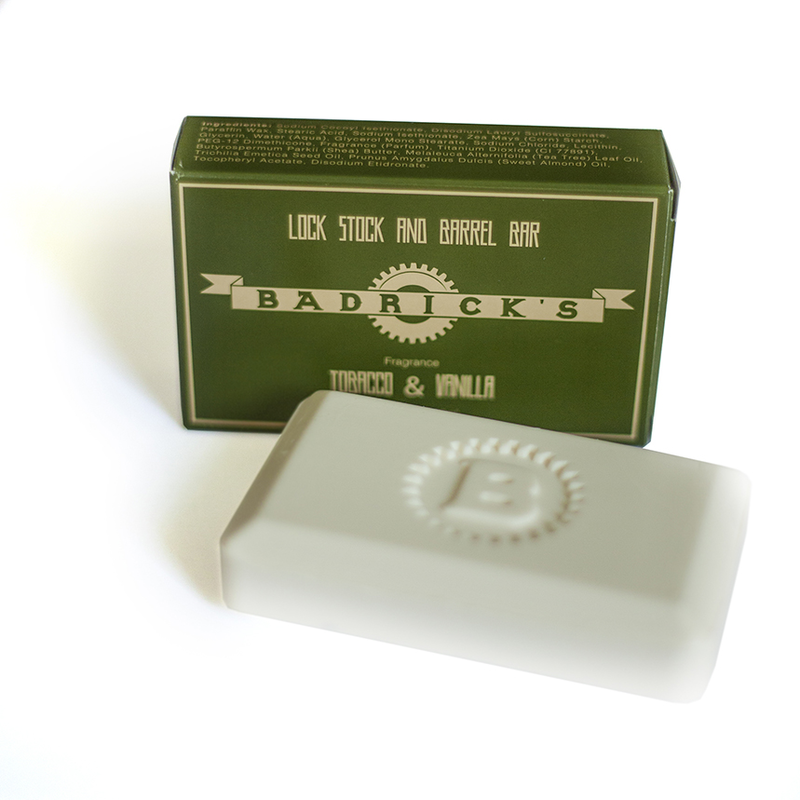 Introducing Badricks’ Lock, Stock, and Barrel shampoo Body Bar. Badricks’ all in one cure for a refreshing shower or Bath experience. With our natural oils and Butters infused into our Shampoo body bar, feel clean without build up or that crazy film that still makes you feel dirty. Butyrospermum Parkii (Shea) butter- Emollient butter from the nut of the African Karite tree, expeller extracted and filtered, shea butter has been used for centuries for its skin protectant properties. Containing natural occurring Vitamins A, D and E.
Melaleuca Alternafolia (Tea Tree) Leaf Oil - Tea Tree Essential Oil, Melaleuca alternifolia, has gained immense recognition as the strongest anti-fungal, anti-viral and anti-bacterial essential oil. It is often used in wintertime cold formulations to keep germs from spreading. It is helpful with Acne and can help fight cold sores and heal wounds. Trichilia Emetica Seed Oil - Also known as the Cape Mahogany – is a beautiful slow-growing hardwood tree that grows up to 30m in height. It is evergreen with dark glossy leaves, red-brown bark and fragrant creamy yellow flowers. The trichilia tree is found across Southern Africa in low altitude, frost-free areas, mainly along rivers and the coast. The pear-shaped fruits dry out and split into three segments, hence the name trichilia, which means ‘in three parts’. Inside the fruits are bright red seeds that are rich in oil. A single tree yields on average around 20 liters of oil. Oil from the seeds of the trichilia tree forms a solid butter at room temperature and melts at 30˚C. The butter is rich in essential fatty acids (palmitic, stearic, oleic and linoleic) and has been shown to have antimicrobial and anti-inflammatory activity due to the presence of limonids such as Trichilin A. It has also been shown to scavenge free radicals more effectively than many other oils on the market. *Leaves Skin cool and hydrated. Prunus Amygdalus Dulcis (Sweet Almond) Oil - 100% Pure Sweet Almond Oil is a natural oil that's perfect for nourishing and reviving any skin type. Almond Oil is easily absorbed and won't clog pores, promoting clear, soft, healthy skin. This natural skin-nourishing oil is ideal for the entire body. Almond Oil is a natural oil derived from pressed almonds.